Runners from two countries (SA and Namibia) participated in the swap. Runners from five of SA's nine provinces participated: Gauteng, Free State, Mpumalanga, KwaZulu-Natal and the Western Cape. The Western Cape took the lead, with roughly 33% of all participants residing in this province. 92% of all parcels were sent off by the cut-off date of 10 December 2013. 100% of all parcels were sent off by 12 December 2013. Thanks again to everyone who participated - I hope you had as much fun as I did! 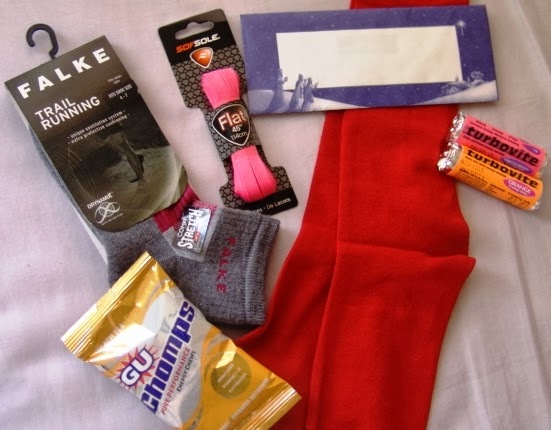 A special thanks to my sock swap partner - my parcel of happiness was waiting for me when I returned home from hospital and definitely brought a huge smile to my face. I can't wait to start using my goodies! Here's to an even bigger and better swap in 2014! I am very glad for the success. Enjoy your goodies! Thanks so much, Stefano. Wishing you an abundantly blessed and healthy 2014!